Every pizza maker swears they make the best pies in the country, but no chef is as convinced they are working with the best equipment. Too often, pizza operations and chefs are forced to work with substandard equipment, especially pans. 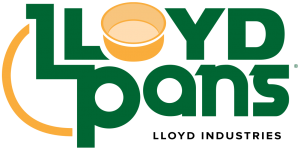 At LloydPans, our mission is to craft innovative pizza pans and pizza tools that give our customers advantages in baking performance, durability and cost savings. 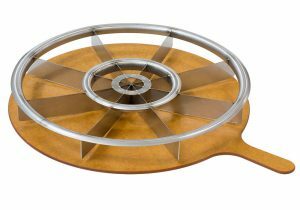 Here are five of our must-have pizza pans and pizza tools for every pizza operation and restaurant looking to improve the quality of their pizzas. The product that established our reputation in the pizza industry, and a pan we still make thousands of every week at our facility in Spokane Valley, Washington. Our Quik-Disks make pizza screens obsolete. They are more durable than screens and offer greater overall value. Screens bend easily and most are replaced within six to 24 months, while most of the Quik-Disks we have sold since 1989 are still in use today. This unique pizza is sweeping the United States, growing in popularity among both consumers and chefs. It’s one of our best-selling pans for good reason. We’ve spent years developing the perfect pan that gives these unique pies a crispy crust and airy interior. And now that we’ve perfected the Detroit Pizza Pan, we’re adding more products to the line, including perforated versions and extra-large sizes. 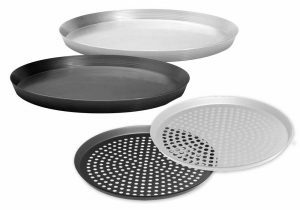 Deep dish pies have their place beyond Chicago, and our pan solutions experts have developed a comprehensive line of deep dish nesting, stacking and perforated pans. 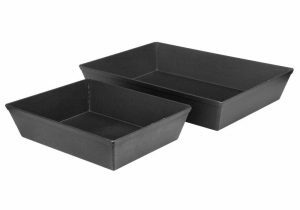 Whether you need straight-sided or angled pans, our deep dish pans provide our customers with a durable pan that will last longer than any other pan on the market. 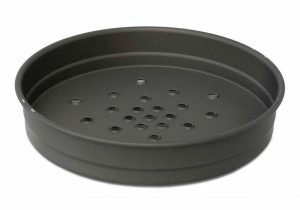 Need a rimless pan to roll out and trim dough? You should be using our cutter pans. Use a solid cutter pizza pan if you’re looking for a softer, more buttery crust. 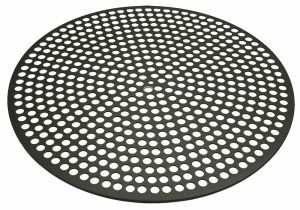 For a slightly crispier crust with a bit of snap to it, use our perforated pizza pan featuring 20% airflow to 80% surface ratio. A name that says it all. This multi-blade rocker knife is perfect for operations that need to ensure slices are equal-sized, and cut quickly and safely. It’s a solution that is currently being used by schools and other industrial foodservice operations around the world. The Equalizer takes advantage of all the benefits of a traditional rocker knife, but it’s unique design means you can cut an entire pizza at one time, and with multiple slice size and options.